​Birthing Pools, as the name suggests are used in Hospitals in the delivery wards to aid in child birth. The pools are made of durable fibreglass with a 25mm urethane insulation core. The pools come with a removable low seat. We offer two sizes of birthing pools, the 1200mm diameter and the 1400mm diameter, both pools are the same depth 685mm over all height. We can offer steps with handrails and also surround grab rails as optional extras. 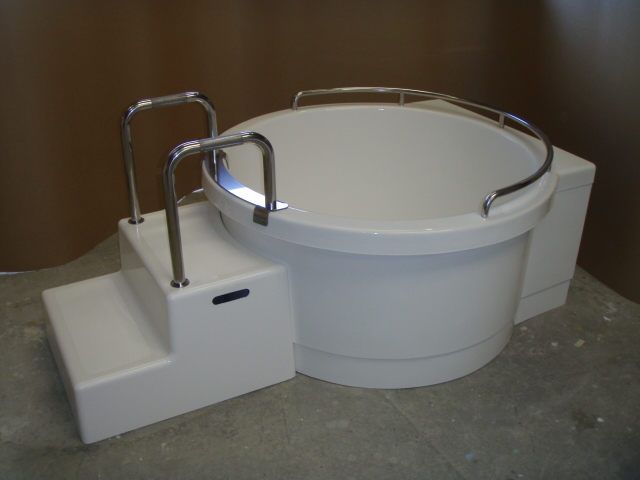 The pools are designed to go against a wall but not into a corner as it is intended that helpers can work around the patient although we are able to make up spacers for corner installations if required. The steps are not fixed to the pool and can be removed when necessary.